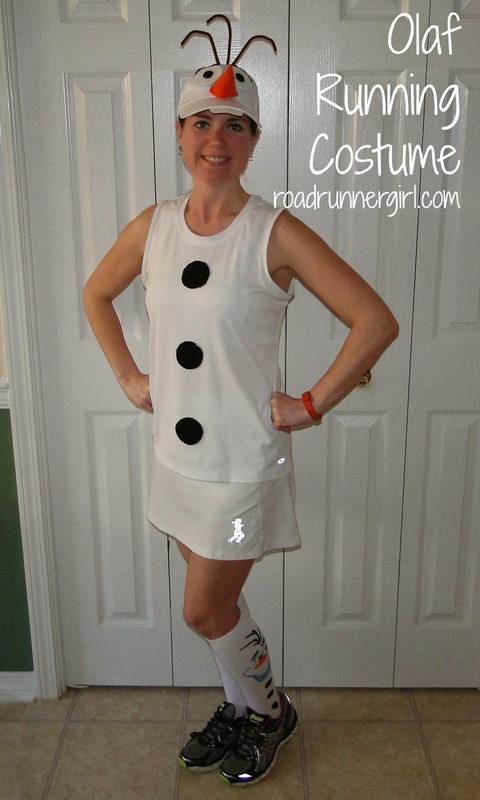 Road Runner Girl: Olaf Running Costume! It's that time again! 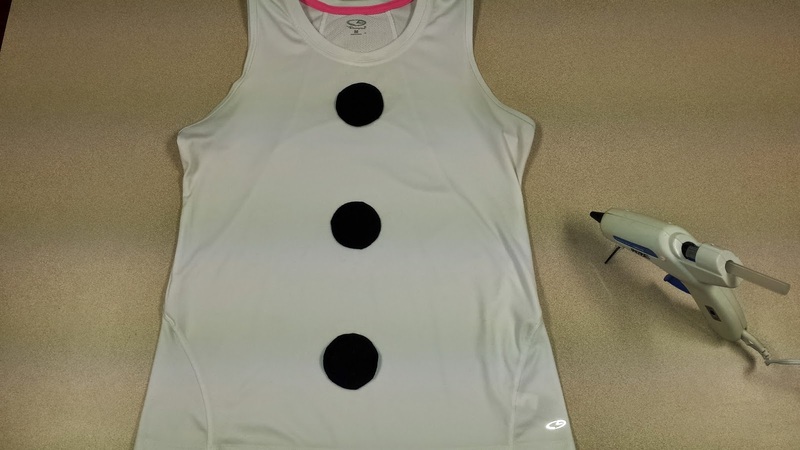 runDisney costume making time! One of the best parts of running at Disney World is running in a costume! It's so much fun! Although I like to dress up I try to make my costume out of running clothes so that I am comfortable. I still have to run those miles! This year I'm doing the Glass Slipper Challenge...which means I'll be running the 10K on Saturday and the half marathon on Sunday. So I need two costumes! For the half marathon I'm dressing up with my roommates. We are all going to be the same thing. But for the 10K I'm all on my own since my roomies aren't running it. After months of thought I decided to keep with the Frozen theme since that's the theme of this year's Princess Half Marathon weekend. Last year for the marathon weekend 10K I dressed up as Anna from Frozen. That costume no longer fits me since I've lost so much weight. So it was back to the drawing board. 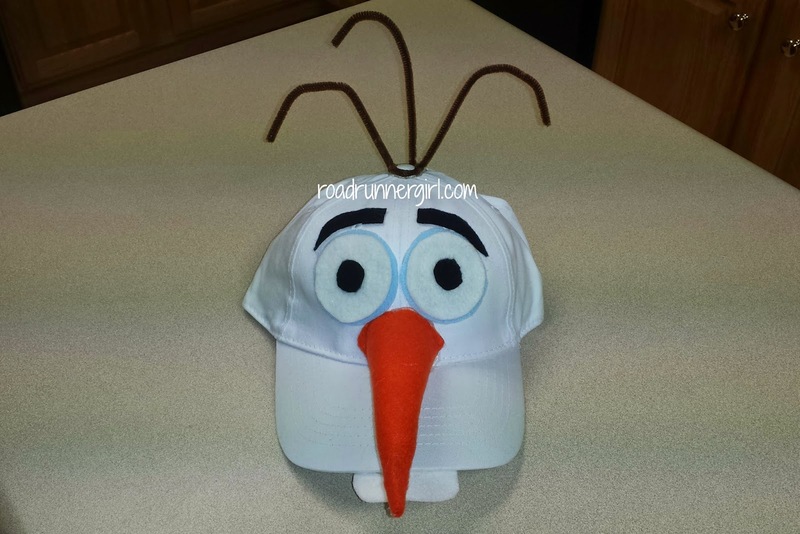 One of my favorite characters from Frozen is Olaf. So Olaf it is!!! Now just a heads up. I wish that I was super crafty and creative but I'm not. So NO I didn't come up with this costume all on my own. Thanks to my friend Google, I found tutorials and templates from East Coast Mommy and All For the Boys. Without those two sites I would have been clueless lol! First I gathered all my materials. 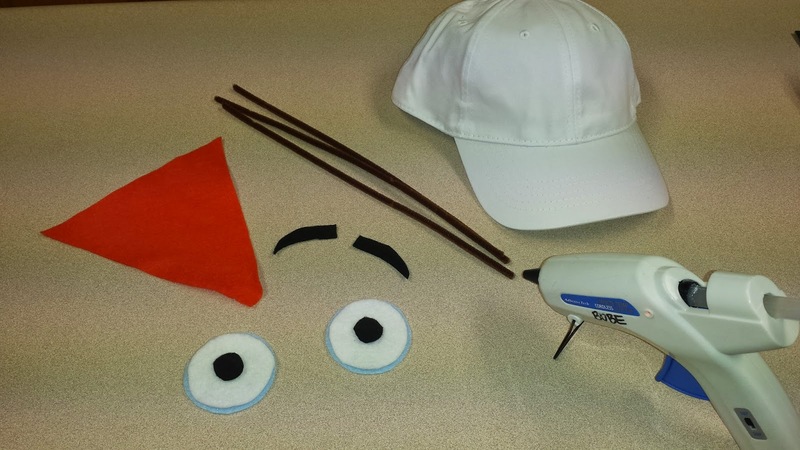 I needed a glue gun, different colored felt, brown pipe cleaners, poly fill, scissors, the template, and a white hat (which I got from Walmart for about $3). Then I started cutting out all the felt using the template. After the pieces were cut out I started hot gluing them all together. I started with the eyes. 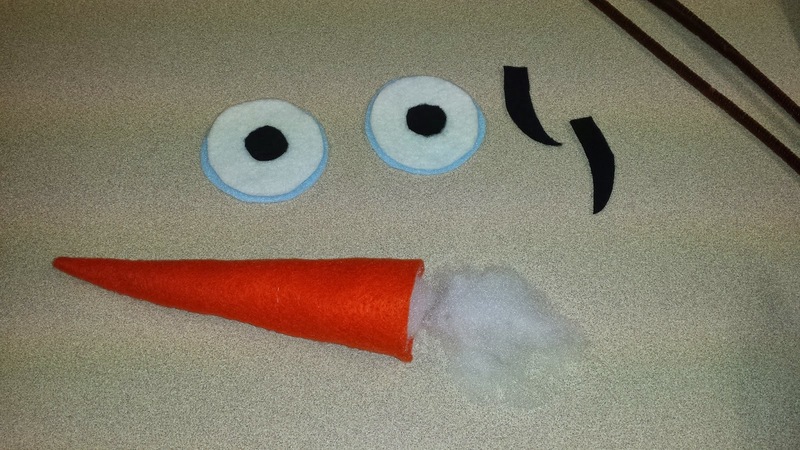 And then I tackled the carrot nose which was the hardest part to glue! Finally I got the carrot nose glued. So I stuffed it with poly fill. Then it was time to hot glue all of the pieces onto the hat! 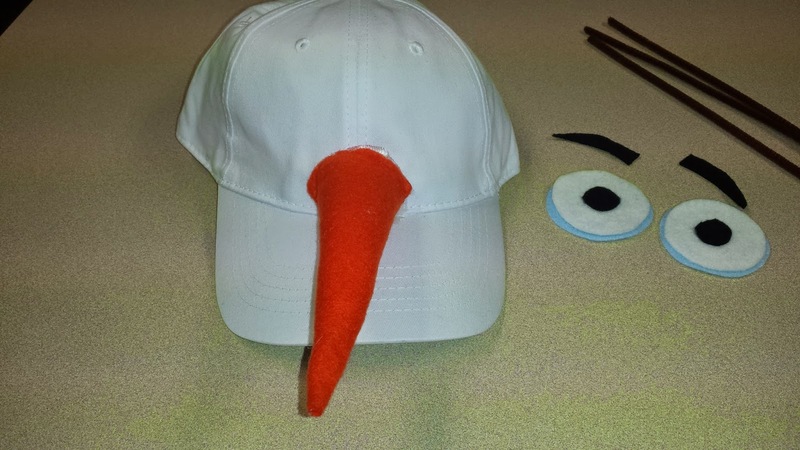 I glued the carrot nose as close to the bill of the hat as I could. Then came the eyes, eyebrows, and tooth! 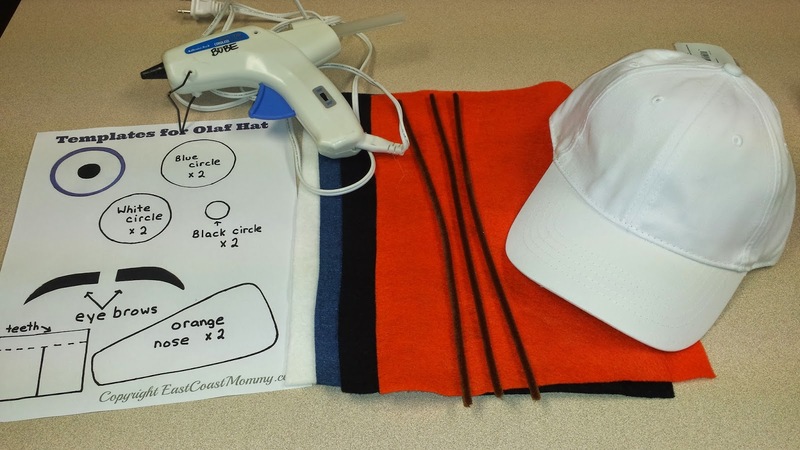 Then I shaped the pipe cleaners the way I wanted them and glued them to the top of the hat. Easy! For the shirt I used the template for the eyes to make the black buttons. I cut out the pieces and hot glued them to my shirt. The shirt I used is one that it a little big for me now. It also had a stain on it that I was able to cover up with the black button. So it was perfect! All in all this was a super easy costume to make! I'm pairing it with my white running skirt and Olaf socks that I got from Target a while back. :-) I'm super excited to run the Enchanted 10K as Olaf!!! QOTD: Who else is running the Glass Slipper Challenge? Or any of the races at Disney Princess Half Marathon Weekend? What costumes are you wearing?